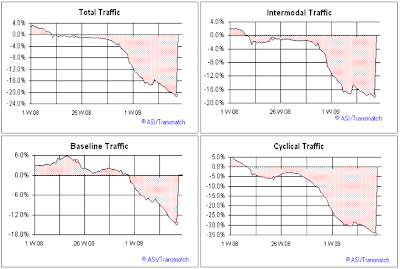 The weekly Railfax Rail Carloading Report still looks grim. Here are a couple of charts. 13-week moving averages are still moving lower, with no apparent end in sight. The first chart shows the one relatively bright spot is coal. I hear the same message about coal from trucker friends. I travel a number of routes regularly with my job and one site I pass amazes me. It is a local trucking company property. In early summer 2008 there were maybe 100 total trucks and trailers. Today, there is not much room left in a 12 acre area with 100s for trucks and trailers can not guess the number of trailers stacked 3 to 4 high. I had heard through a trailer dealer that this trucking company solely purchased equipment to move wind energy projects for a number of years and this year canceled all equipment orders. I also pass by a switchyard for a BNSF line between Seattle and Chicago once a month. The switchyard is a transfer point for the main line to a local. Freight would wait until there was an opening on the local line or an available engine. Prior to July/August 2008 the yard would have various car carriers, containers and other freight along side the coal cars destined for the power plants. Today only the coal cars are parked there. There is no waiting, except for coal. FleetOwner is reporting Truck Freight Down Until 2010. Truckers larger and small will need to keep their belts tightened into the early part of next year before they can expect to see freight volumes start increasing, according to the latest industry analysis compiled by FTR Associates. In a conference call with reporters last week, FTR analysts noted that for freight to start recovering, it must "reach a bottom first" and they predicted the bottom will be reached in the third to fourth quarter of this year. That will lead to a recovery in freight volume to begin sometime in the first quarter of 2010. "I definitely think we're approaching the bottom now," said Noel Perry, founder and principle of Transportation Fundamentals, who also works for FTR Consulting Group as managing director and senior consultant. The problem, Perry explained, is the issue of "cumulative stress" on the trucking industry. Trucking has actually been in a recession for almost 21 quarters, he pointed out, exacerbated by the "overbuy" or trucks in late 2006 ahead of the 2007 emission regulations. "Many carriers are now really short of cash due to the length of this recession," he continued. "Also, there's almost 250,000 under-used trucks out there competing for freight and that means profit margins will remain under pressure." The good news is a bottom might be coming. Unfortunately it will not feel like it because the recovery will be anemic. Moreover, competition for loads will increase as idle and under-used truck capacity starts fighting for loads.